When Kate Middleton married Prince William last April, many brides-to-be paid close attention to every detail, including the bridal bouquet. Following Kate’s sophisticated fashion sense, her bouquet was simple, elegant and understated. Unlike Princess Diana’s flowing waterfall of flowers 30 years earlier—resplendent of the opulent ’80s—Kate chose only a handful of posies for her less-lavish bunch. No expensive, exotic orchids or other imported tropicals for the new princess. Instead, Kate’s choices were all common flowers native to her home country of England. Their simplicity, however, only added to their minimalist beauty. If you want to duplicate the look for your upcoming wedding, check with your florist as to whether Kate’s choices of flowers will be available at the time of year you are being wed. While many of them may be familiar garden flowers, not all florists will have an easily accessible source for them. Plus, even if your florist can obtain these options, the blossoms may be out of season, resulting in exorbitant prices. If any of these issues impact their availability for your bridal bouquet, rely on your florist to suggest other choices that are in season, more affordable and that can replicate the same look at a fraction of the price. 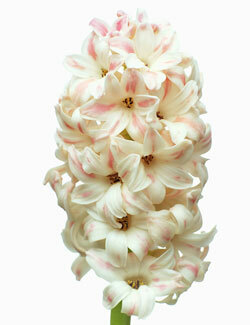 Hyacinths are popular due to their fragrant blossoms and wide range of colors (though Kate chose conventional white). You’ll recognize this beauty’s long clusters of flowers dripping from the stems. The small, white flowers of this plant are shaped like tiny bells. They are another fragrant posey. These ivory flowers grow from a scented shrub. Their glossy green leaves offered a striking but tasteful contrast to the pale flowers in Kate’s bouquet. Even if you love the look of Kate’s royal bouquet, you don’t necessarily have to copy it exactly to get the same fashionable feel. Choose other varieties of blossoms with small, delicate flowers in a monochromatic color scheme. Discuss the options for your bouquet with your florist. Rely on his or her knowledge and experience to create a bridal bouquet that is as distinctly you as Kate’s was for her. For more on the Royal Wedding Flowers and Kate Middleton’s Bouquet, read this article by TheBeautyBridal.com. « How Big is the e-Commerce Industry Really? What a stunning article! You definately have given me some good pointers when choosing my bridal bouquet. Michelle: Thanks for the kind words. We’ll have lots more articles on related topics in the future, so keep an eye on the blog to learn more about flowers for your wedding! The one thing you didn’t bring up was how labor intensive the royal bouquet was. While Lily of the Valley in season from a local grower may not be overly expensive, the blooms in Ms Middleton’s bouquet were hand wired to create this look. Hand wiring small, delicate blossoms is incredibly labor intensive and makes this bouquet quite expensive. The overall look of simplicity can be deceptive when it comes to cost. You make an excellent point. And this, of course, is where the talent of your florist becomes critical. Brides need to discuss their desires with their florist and let the florist guide them on how to choose flowers that fit within their budget–especially once you add in the florist’s well-deserved fees that are necessary for creating this type of labor-intensive designs. Choosing a flower that naturally resembles the look of a variety such as Lily of the Valley can help keep costs affordable. Thank you for a well written and interesting article. Ms. Middleton’s bouquet was stunning. 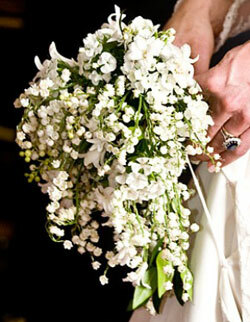 The simple, but breath taking Lily of the Valley bouquet only added to Ms. Middleton’s charm. Thank you for sharing this information with us.